All the District Educational Officers in the state are hereby informed that Centre for Teacher Accreditation (CENTA) is a social enterprise which conducts CENTA Teaching Professionals' Olympiad 2017 (TPO 2017), an online test on 9th December 2017 in two centres in Vijayawada and Visakhapatnam in A.P, Hyderabad and Secunderabad in Telangana, Chennai in T.N and Bangalore in Karnataka. * Both in-station and out-station participants need to take care of their own travel and other arrangements and expenses. * However, some of the Subject Tracks may not be available in all the time slots (details in the registration form). The details of the test CENTA are given below. 1. TPO is an objective, multiple choice and computer-based test to be completed in 2 hours. 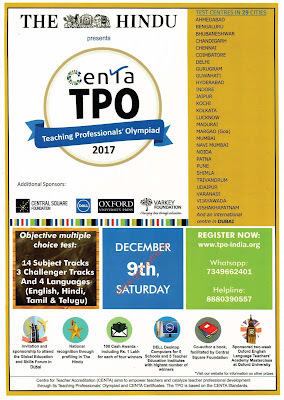 Subject Knowledge, Classroom Management and Logical Abilities and Communication are the three main sections of the test., This year teachers can take the Olympiad in Telugu (Primary level only) as well as in English mediums (Primary, U.P and Secondary levels). Telugu primary mixture of subjects is added to the competition specially to encourage participation of teachers from Andhra Pradesh and Telangana. 2. Results of TPO 2017 will be announced in January 2018. Each participant will receive a detailed confidential performance report which will be accessible only to the participant with a personal user ID and password. Individual reports will not be shared with the school or the education department. 3. Top 500 national rank holders, 14 subject-wise rank holders, Regional rank holders as well as winners from Government schools and regional languages (Telugu, Tamil, and Hindi) will get following rewards. 1. 2 winners in Middle School English Challenger track will get sponsored for a 2-week training in at Oxford University, England. 2. First 4 national rank holders will get a cash prize of INR 1 Lakh each. 3. First 14 Subject-wise winners will get invitation and sponsorship to attend Global Skills and Education Forum to be organized at Dubai. 7. 15 regional winners will get featured in The Hindu. Two-hour, multiple choice test, no negative marking. Competencies tested are based on the Centre for Teacher Accreditation (CENTA) Standards. Computer-based, but the interface is very simple and does not require knowledge of computers! Three sections, no section-wise time limit, questions can be attempted in any order. The first section differs based on the subject chosen. A candidate can participate in more than one subject track (maximum of 3). In case you are registering for more than one test track, you would have to take Section 1, 2 and 3 for only ONE of the subject tracks and ONLY Section 1 for the others. * Please note that the subject(s) you choose for TPO may or may not be your current subject; it is entirely your choice. TPO Challenger is an additional option available in Middle school Maths, Science and English. Candidates will take the main two hour test and an additional section for 1.5 hours after a short break. For more details on TPO Challenger given below. What is Challenger and in which subject track is it being offered? An in-depth test of subject expertise and is meant for teachers who have deep interest in their subject. For how long is the Challenger? PLEASE DO NOT register for both the main TPO and the Challenger in the SAME subject, since the main TPO is automatically included in the Challenger. To register for TPO Challenger, in the ‘Test details’ part of the registration form, select ‘Middle School Maths Challenger’ or ' Middle School English Challenger' or ‘Middle School Science Challenger’ as your test track. ** Place of residence (NOT test centre) will be used for Regional and City ranks. What are the prizes? Who all get them? TPO Certificates for all Rank-Holders. All Schools, Organizations, B.Ed. colleges and other TEIs with any rank-holder to receive TPO Certificates. Profiles of winning B.Ed. students to be shared with schools in the region. Profiles of B.Ed. colleges / other TEIs with winners to be shared with schools in the region. 50 rank-holders from government and affordable private schools to receive scholarship from Michael & Susan Dell Foundation to pursue CENTA Certification ('Social Impact Awards'). International Conference Sponsorship, Dubai 17 winners to attend Global Education & Skills Forum, by Varkey Foundation in Dubai, with airfare and accommodation sponsored. H.Ms/Principals of ZP/Govt./Municipal/KGBV/APSWRIES /APTWRIES/APMS/Pvt. Aided or Unaided Schools and to all Primary School Teachers through MEOs and encourage their extensive participation and empower their professional skills.